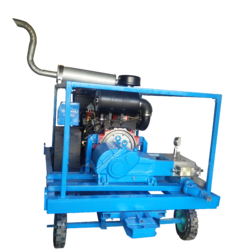 We are a leading Manufacturer of high pressure water jet machine and high pressure water jet cleaning pump from Thane, India. 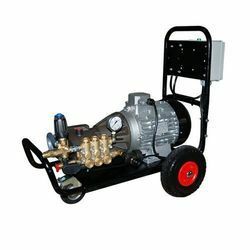 High-Pressure Water Jet Machine is a high pressure reciprocating plunger pump that uses high-pressure water jet to remove mold, grime, dust, mud and dirt from surfaces and objects such as buildings, vehicles and concrete road surfaces. These are used for surface cleaning, or for the demolition of products made of metal, wood, concrete, stone, plastic, glass or other building materials. Model No. Maximum Flow (LPM) Maximum Kg.cm2 Pressure Maximum H.P. 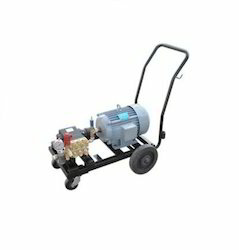 High Pressure Water Jet Cleaning Pump has been used for multiple industrial applications around the world, and is recognized for its capability to provide powerful, environmentally safe ways of solving difficult cleaning, cutting and surface preparation problems. We are committed to offering our clients a wide collection of High-Pressure Water Jet Machine. All the products are designed in compliance with international quality standards, making use of high-grade components and spare parts that are sourced from the certified vendors of the market. Moreover, these products are offered in various specifications.